The anatomical arrangement of the heart consists of a conduction system, a reservoir-mechanical system and a blood supply-drainage system. The conduction system consists of the sino-atrial node, the atrioventricular node, and the Purkinje fibers. The blood supply-drainage system consists of the coronary arteries and the coronary sinus. The reservoir-mechanical system consists of the vena cava, right atrium, right ventricle, and pulmonary artery on the right side of the circulatory system, and the pulmonary veins, left atrium, left ventricle, and aorta on the left side of the circulatory system. All three anatomical systems must work together for optimal cardiac function. Anatomical or functional derangement of one system can affect the other systems. Upon gross inspection of the left ventricular cavity, the endocardium appears irregular, exhibiting many trabeculations. The epicardial border is smooth and well defined. Measurements of wall thickness usually becomes dependent upon the clarity of the endocardial border. In the left ventricular outflow tract, the endocardium is smooth and regular, with an easily definable endocardial border. In the area between the left ventricular outflow tract and the papillary muscles, a transition from an irregular endocardial border and a smooth endocardial border occurs. Between the endocardium and the epicardial borders, the myocardium is present. 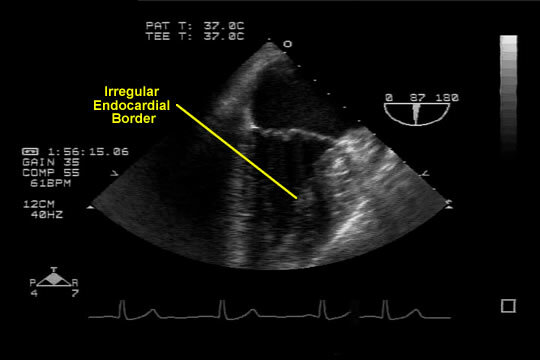 The image above and the videos to the right and below show the irregular borders of the ventricle and the smooth borders of the outflow tracts. 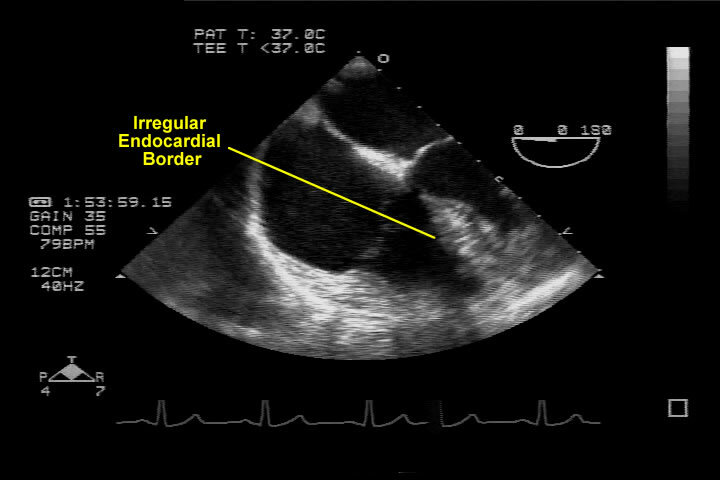 The left ventricular endocardial border, while slightly irregular, appears smoother than the right ventricular endocardial border. Moderator bands, seen in the right ventricle, are rarely seen in the left ventricle. Moderator bands are thickened muscular trabeculations that can be seen during an echocardiography exam. Two papillary muscles are positioned anterolateral and posteromedial and are aptly named, the anterolateral and posteromedial papillary muscles. Sometimes, especially at the papillary muscle base, the papillary muscles become divided and appear as multiple bundles which may interfere with endocardial border detection. The papillary muscles have chordae tendinae which attach to the anterior-lateral and posterior-medial mitral valve leaflets. Rarely, chordae tendinae or other fibrous bands may attach to the left ventricular wall, usually the interventricular septum. The heart muscle is anatomically one muscle (from the pulmonary artery to the aorta) . The single muscle is arranged into a double helix which forms the right and left ventricles. This helical arrangement accounts for the contraction pattern of the left and right ventricles. The proximal end the muscle band starts at the pulmonary artery and the distal end of the muscle band ends at the aorta. The single band of muscle starts at the interventricular groove and wraps around the back of the heart until it folds upon itself to form the left ventricle . As it forms the left ventricle it spirals downward to the apex of the left ventricle and then upward towards the aorta. During a contraction, the short axis and the long axis of the left and right ventricles decrease and the myocardial walls thicken. While the long axis (base to apex) of the left ventricle is shortened the apex of the left ventricle does not move. 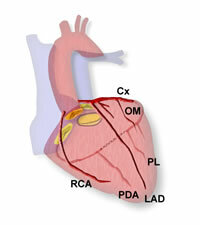 The base of the heart moves towards the apex during contraction. The heart is arranged in a suspension unit. The suspension unit is anchored by the base of the aortic curtain and anterior mitral valve leaflet. The suspension unit also includes the attached chordae tendinae, papillary muscle, and myocardial wall. A line, drawn from the base to the myocardial wall, in diastole, will cross each of the parts of the suspension unit. All of the parts of the suspension unit are involved in the contraction process. Disruption of any of these segments may affect the contraction of the heart.